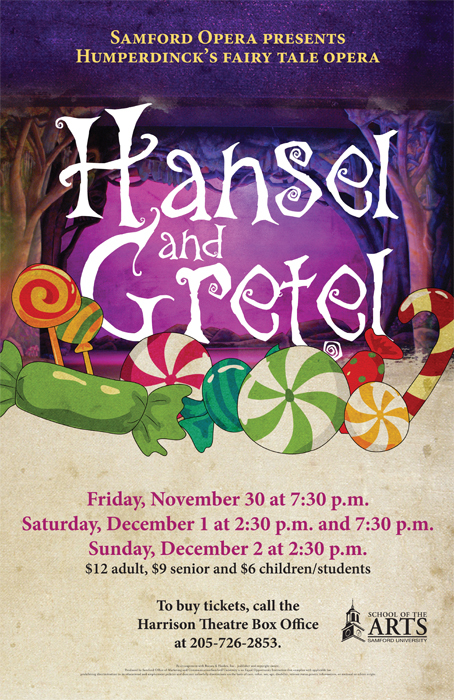 Samford’s School of the Arts will present the beloved fairy tale opera 'Hansel and Gretel' Nov. 30–Dec. 1 at 7:30 p.m., and Dec. 2 at 2:30 p.m. in Harrison Theatre. The musical classic by Englebert Humperdinck and Adelheid Wette, first performed at Christmas in 1893, is a lively holiday event for the whole family. Tickets are $12 (adults,) $9 (55+) and $6 (students/children) at (205) 726-2853 or online.